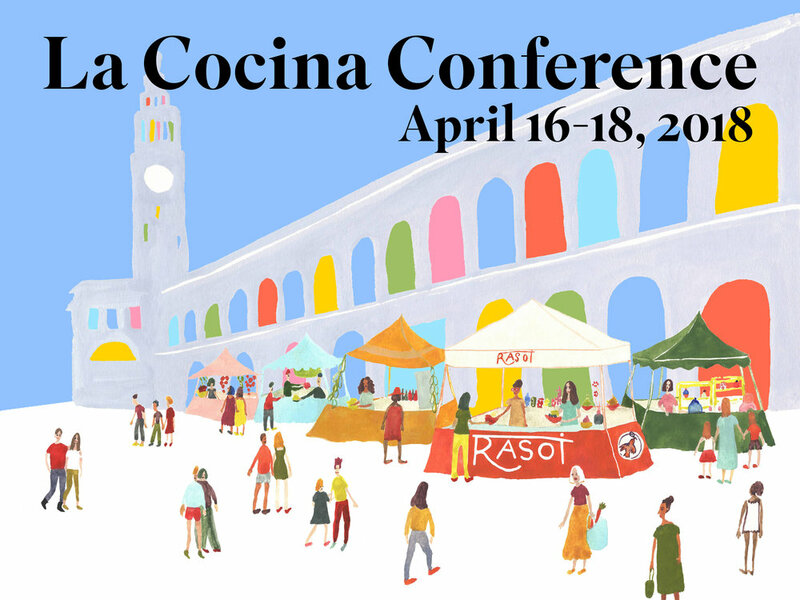 The 2018 La Cocina Conference focused on the way food businesses shape equitable communities. Over the course of a year, I project managed this event from start to finish. The role of Conference & Storytelling Project Manager was a unique opportunity to cultivate and foster new relationships around the Bay Area in the food justice space. It’s been so exciting to see the conference come together, and to have worked to center La Cocina’s work and shift perception about the organization’s role as a thought leader. The conference dinners were designed to begin some of the conversations we were planning for the conference itself. The goal was dual - to identify potential partners and stakeholders, and to learn which discussions would add value to the conference, and which would best stand alone as separate events. The first, held on November 20th at El Buen Comer in San Francisco, brought together Bay Area chefs to discuss labor in the restaurant industry. It was a room filled with numerous talented chefs, and it became clear that what attendees sought was practical advice in how to organize around issues such as affordable housing. The conversations held that evening directly influenced several panels at the conference - Knives & Forks: Tools for the Political Advocate, and A Roof Over Our Bread: Access to Affordable Housing. The evening also planted the seed for the idea of the conference presenting attendees with ideas that are active rather than passive. Our intent was to isolate certain topics for discussion that were known to act as a barrier to equity - race, or gender, for example - and then offer attendees insights from individuals or organizations who had challenged those barriers, and sought to remove them. The second conference dinner was held at Nyum Bai in Fruitvale on February 26th, and focused on creating equitable communities - particularly focusing on development, and community organizing. This dinner was so different from the first - it revealed a real hunger for collaboration between various community groups - and offered some food for thought on how we can upend the status quo. By 2053, just 10 years after the country is projected to become majority non-white, black median families will own zero wealth. Currently, people of color occupy 50% of entry-level positions (and are paid 56% less than their white coworkers in the same roles), and only 7.8% of executive positions. How do restaurants, income and culture shift when people of color occupy managerial, ownership and other positions of power? What’s the broader effect on wealth acquisition for communities of color and how can restaurants lead the way to a more equitable society? Why is it important and how can financial institutions, entrepreneurship programs, hiring managers and diners work to end racial segregation in the food industry? Arby’s today employs more people than the coal mining industry. Service work wages are increasingly the face of working class in America putting new pressure on restaurant workers to support the welfare of their workforce. Talk to any food business owner about the struggles of ownership, and the conversation will inevitably turn to labor. Finding it, retaining it, taking care of employees, and finding ways to create jobs that are sustainable. In this session we will hear three different voices of labor in the food industry and how they make it work: a food business owner trying to make the number work for her employees and herself, a restaurant worker who makes their life in service, and a city official focused on workforce development in the face of our new service economy. How can developers and large scale placemakers partner more effectively with food business owners and small businesses? In an era where consumers are seeking out small and local businesses, and developers often see empty ground floor units as a challenge to be solved, how do we explore and advocate for new partnerships and models of change? How do we create equitable opportunities for both developers and food business owners? In 2017 San Francisco passed New York in the number of Michelin starred restaurants that call this city home, and retains the crown of most number of restaurants per capita (37.3). But long before the stars, San Francisco was known as a bastion of food thanks to the variety of foods on offer, and the shapes and spaces that delicious food is served up. Not to mention the diversity of owners and chefs making that food. In this sessions we'll hear stories from the food business owners not often covered that make the Bay Area a true food destination. Are restaurant menus an acceptable forum for education about policy and politics? We’ll hear from chefs that have added politically-charged information to their menus (ie- providing healthcare to employees, equity in tipping between front and back of the house, gender neutral signs on the bathrooms, immigration, etc) as well as chefs who don’t think it’s a good idea. We’ll learn about how their customers and staff have reacted, as well as how and why they chose their issue areas or chose not to bring. Restaurants are an example of the power of investing in people and business ownership to transform neighborhoods. Why do some places work and why do others not? How do we make a food-first oriented space work that still feels equitable and inspiring? This is a conversation at the intersection of how place is created: the economics, the politics, the community, what inspires people, and what nourishes them. Food media, like everything else, cannot escape implicit bias. In this session we seek to highlight the approaches of several publications who have chosen to be more intentional about who the gatekeepers of food media are. We will also be exploring publications who have decided to become more political in how they write about food, or have used food as a lens to be more political. You're engaged on an issue, you're ready to put in the work, so... what's next? In this session we will hear from a number of food justice activists who have found ways to amplify their voice - through media, local government, and policy. How does giving and lending money change when you focus on offering money to food businesses led by people of color? In this session, we hear from a bank, a lender, and an advocacy group to learn from their expertise. One thing has become abundantly clear in the wake of the Me Too movement - women should occupy more leadership roles, in every industry. Especially the restaurant industry, where women are frequently left behind in pay, and opportunity, and also frequently bear the brunt of unsafe spaces. It is clear that there is room for new models of leadership. Luckily there are many women led businesses we can turn to, and in this session we hear from industry leaders about what practices they use to structure kitchens where talent of all genders can thrive. Any food business owner talking about labor will quickly move into a conversation about a lack of housing and reliable transportation. Without affordable housing options and effective transportation options, it’s difficult for those who labor to make the food we love to make their lives work. How then can we come together in the fight for housing and transit options that support all different careers and businesses? In this session, we will explore various models offering solutions to the crisis of affordable housing. How do we tell stories about immigration and food? In this session we'll hear stories from a number of speakers about immigrant food journeys - how recipes cross borders, and how much more beautiful and delicious the culinary landscape is when immigrant led businesses put down roots.